Some people have had trouble downloading the XenDesktop Beta (Feb 2008) and I concluded that at least I could help by providing the XenDesktop Getting Started Guide online. The guide is provided with the download kit so this is really just a preview of what you are going to get if you haven’t downloaded already or are having trouble getting it. 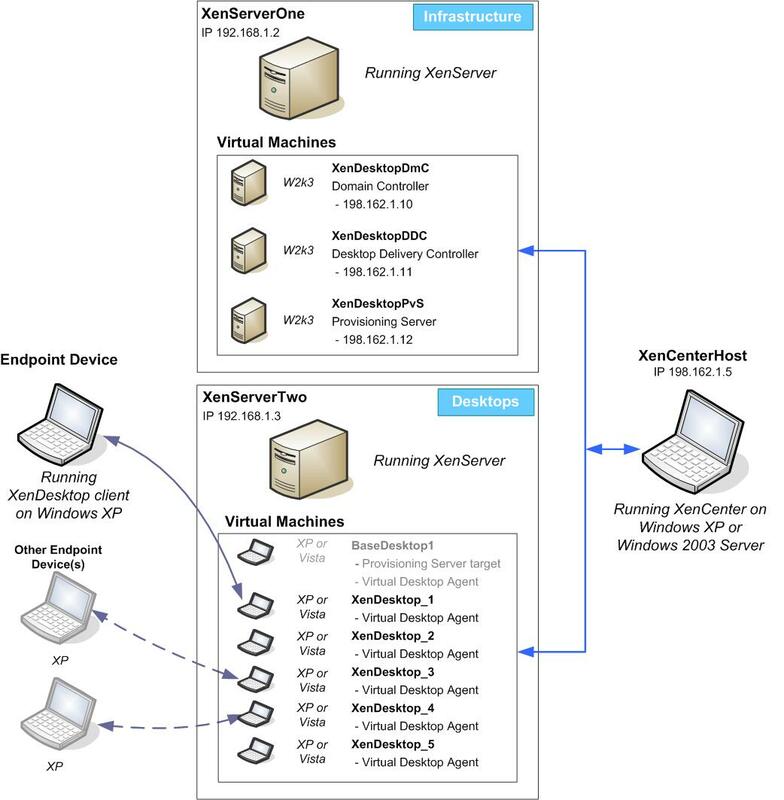 The guide is thirty six pages long and includes a couple of diagrams that help explain what XenDesktop is composed of and how it actually works. Just for reference, the PortICA team works on providing the remoting of ICA with XP and Vista from the virtual machines running on XenServer. In this case our software will be running inside VMs on XenServer 2. All Citrix components are supplied on the XenDesktop Beta installation ISO images. It is important that you use these versions and not versions that you may have previously acquired. Citrix Desktop Delivery Controller Beta. Instead of repeating much of what is in the PDF document for Getting Started, I will recommend that you read it instead. I’ll leave you with some tips from the document that may help. The document states that it will take about a day to setup this environment. You will need at least four physical machines to test this environment (2 XenServer, 1 XenCenter, and 1 Endpoint). You will need a test domain controller and you will need real copies of either XP or Vista to put on XenServer virtual machines. XenServer 1 runs the infrastructure for getting things working. XenServer 2 runs the actual virtual desktops. XenDesktop Beta is the successor to the XenDesktop Tech Preview Kit. The main changes are listed below. 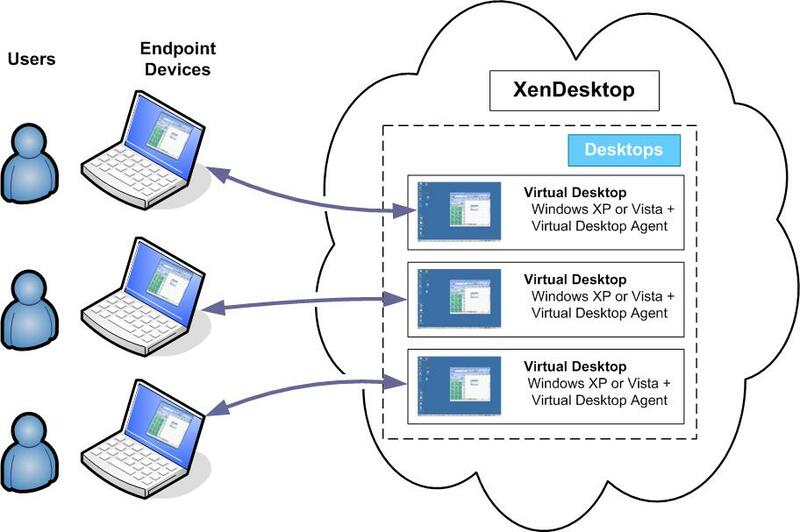 XP endpoint to run a full-screen-only-mode Vista virtual desktop. Vista endpoints are also supported. the section Installation and Configuration Procedures for details. The main use case in this release is for the full-screen-only-mode display of virtual desktops on an endpoint device. In this mode, when a user connects to a virtual desktop, the desktop is displayed as a full screen on the user’s machine. The user experience is nearly identical to that produced by using standard Windows XP or Windows Vista locally. • Desktop Server – Desktop Server has been renamed as Desktop Delivery Controller. • Web Interface – Web Interface is still part of XenDesktop, but it is no longer a separately installable product. Web Interface and it related components do not need to be configurable as part of the standard installation procedures. Active Directory in Windows Server 2003 can now run in both native mode and mixed mode. Previously only native mode was supported. Multiple domain controllers are not supported for this Beta. That’s probably enough information for this one post. There might be more XenDesktop Beta posts coming out later.